To say that the owner of a Ferrari is proud of their vehicle is a given. 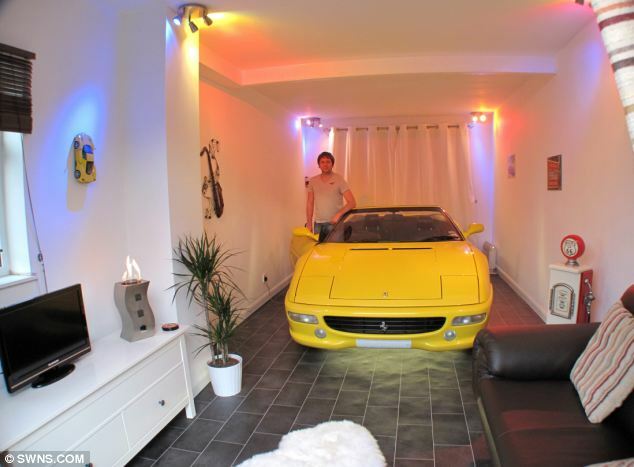 To take that passion so far as to bring the car into your living room… well ok we’ve all thought about that to. Jon Ryder of the United Kingdom took that thought and built it into reality by turning his garage into his living room. 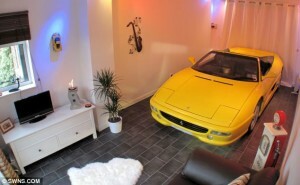 He can now eyeball his beautiful 355 Spider anytime he wants from the comfort of his own couch. When he wants to take his Ferrari for a spin he simply opens the door and cruises away. As soon as Jon moved into his new place he immediately started the plans of converting the empty space into a livable showcase for his Ferrari. Jon takes the 355 to events organized by www.SuperCarDriver.com where owners of other exotic cars meet up for a chat and a drive. Proceeds from these events go to charity, with one event in March raising £2,500 for the Bluebell Children’s Hospice in Sheffield. So there you go folks, the passion for the Ferrari brand is unquestionable. Visit our facebook page and let us know of any other extraordinary Ferrari lovers that you know of!